RESY rests up on the know-how of nearly 20 years of active development regarding this section. 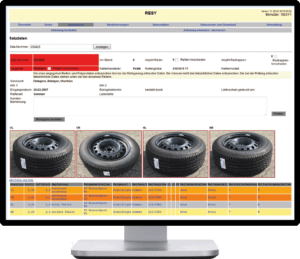 RESY manages any aspect of wheel storage and is the tool for sustainable increase in turnover as well as a constant customer retention. Primarily, you will save time and space concerning the storage and retrieval output. Therefore, the costs will be amortized in no time. Time is primary saved with our mobile device for data capture, called MDE, in addition to our recently developed Android-App. This device allows you to capture and document any work regarding wheels. Amongst others, the testing of tires will take place with our new, wireless gauge for a chord and air pressure. All measured data is transferred wireless to the mobile device for data capture. 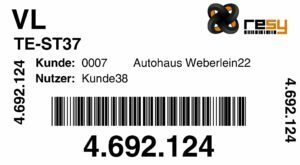 Additionally, you are able to take any number of pictures of the wheels with the MDE, which are transferred by WLAN to RESY and are therefore immediately visually available for you and all customers with web-access. Storing and retrieval output are affected by the MDE and the integrated laser scanner as well. On that point, you solely scan the storage place and the particular wheels and RESY knows immediately where the wheels are located. 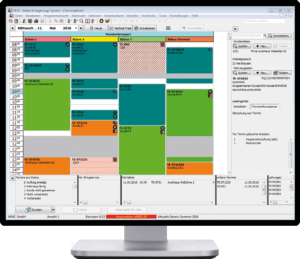 Altogether, you are able to save your time up to 80 per cent. 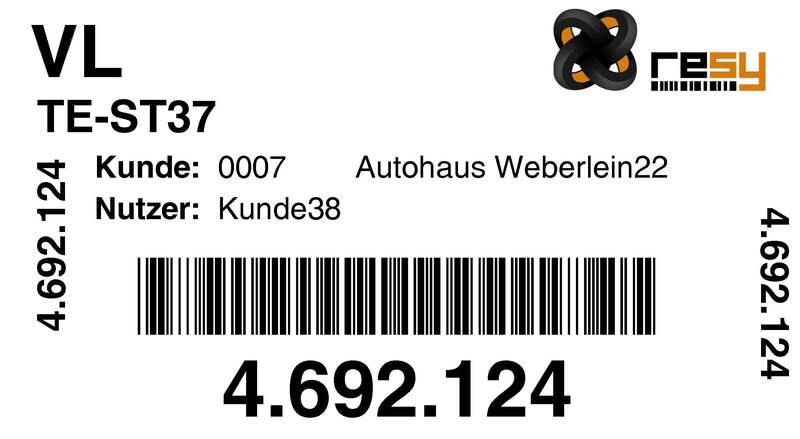 Due to the barcode-scan per MDE and our RESY-App you will constantly have an overview of any step of procedure and the location of the wheels. The capacity of our storage can be fully deployed and even expanded due to the possibility of a completely optional warehousing, as any particular wheel has its own label. Because RESY has the ability to capture an unlimited stock of wheels. 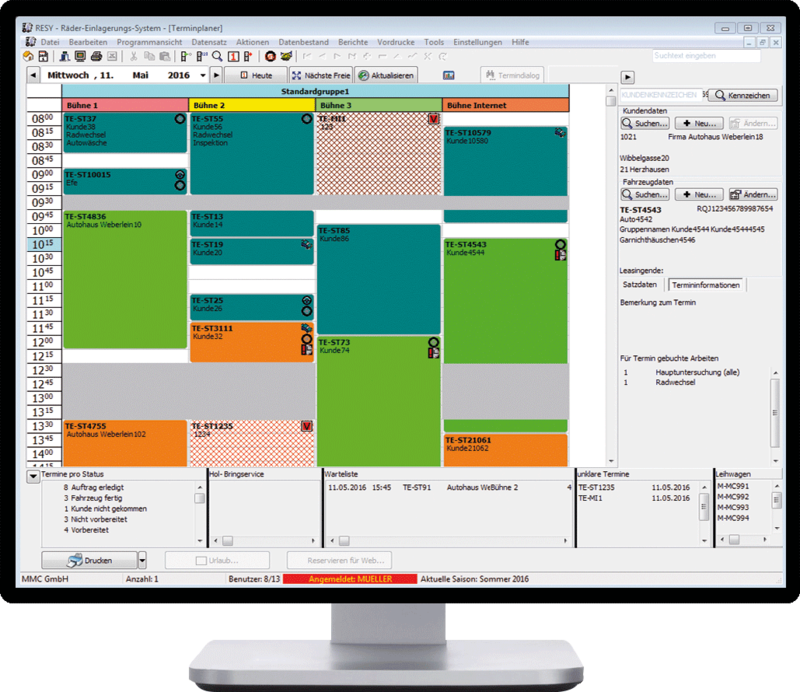 You control all functions -up to the management of customers hired vehicles- with the integrated RESY-scheduler of appointments and shop. The system regulates ideally the occupancy rate of your hoists for you and constructs a more efficient action planning of your employees. Besides, your customers are given the opportunity to book their appointments directly via the website. Via the RESY-Websystem, you give your wholesale customers (e.g. companies with carpool are car dealerships) the possibility to make an appointment online to collect or provide the wheelsets. 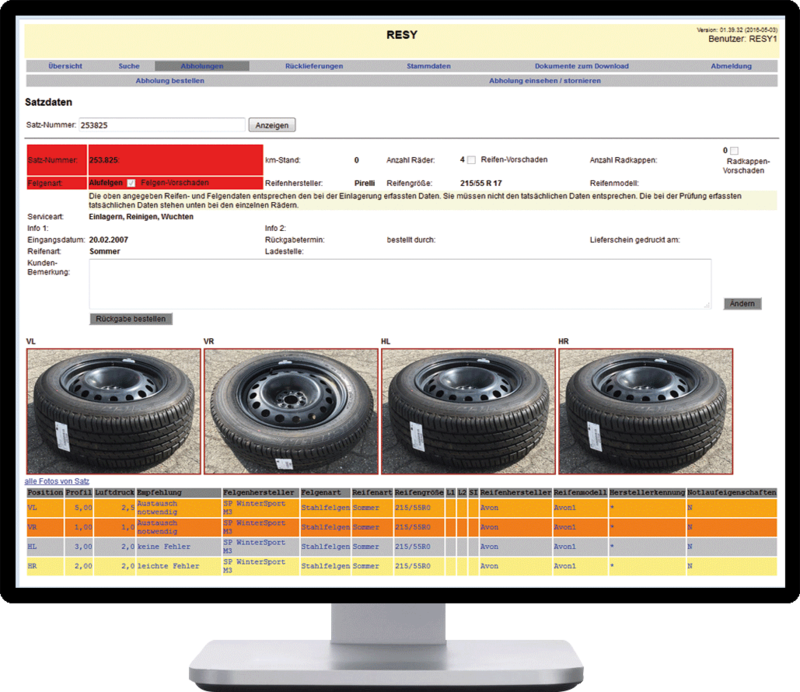 The provision as well as the condition of the wheels are immediately visible for you and your customers in RESY..
"As early as one month after the cutover to RESY, the system was already so well-integrated that we were able to master the season of retrieval output better than ever before." "Due to the chaotic warehousing of wheel sets, we gained a total of one third of more storage capacity. There used to be gaps caused by customer reservations, especially because of the different sizes of summer and winter tires, however, thanks to RESY, we can now store the goods wherever there is space. In addition, because of the scanning of the wheels and the storage place, retrieving the wheels is no problem -even not- if the wheel sets are stored apart." "The time of long searching is over. You know at any time where the wheel is located, wether in the warehouse for provision, on the way or at a certain storage place." "We don't have to run every which way through the whole warehouse by the collocation of orders of appointments to collect the wheels anymore as RESY prints a packing list for the outsourcing. The ideal paths by providing the wheel from the warehouse are regarded as well." "We don't have to guess no more what has already happened to that wheel after the warehousing. With RESY we can clearly see what has to be done yet, whether it is the inspection, cleaning or the inflation of compressed air. It is easily accessable in the history to see who did what at what time with the wheel." We could quote even more arguments of our customers. You might want to convince yourself in a personal dialogue of the capability of RESY. Do not stand in awe to a contact us and make an appointment.